By Brad Balfour | Photo credit: Michael Sherer. One of the truly unconventional stories told through a film this year is that of millionaire socialite Florence Foster Jenkins (Meryl Streep) whose love of music led her to be both a benefactor to many and a performer as well. She owed thanks to her remarkable — and decidedly outre — relationship with husband St. Calir Bayfield (Hugh Grant), who afforded her opportunities to perform and record the music she loved despite her incredibly wretched vocalizations. In Stephen Frears’ biopic “Florence Foster Jenkins,” Streep celebrates this strange story, but in order to play the role without shredding her gifted voice, the legendary star turned to an equally masterful vocal coach for help. Opera coach Arthur Levy made it possible for her to sound like Jenkins. 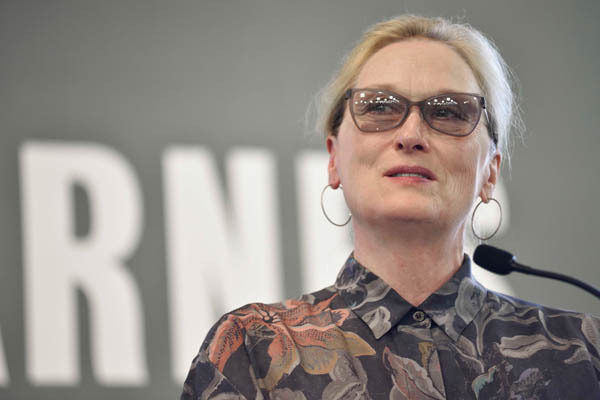 In fact, a large part of Levy’s mission was to make sure Streep could mimic Jenkins’ sound without any permanent damage, but she also had to maintain her standards as well. That’s because Jenkins not only tried singing privately but she also held a famous bought-and-paid-for live Carnegie Hall concert of her performing classic songs and operatic pieces with her screeching soprano. Previous to the concert, Jenkins made several 78 rpm recordings that became camp classics and are in print as various CDs to this day. Since her associates couldn’t entirely control who attended her concert, she received scathing notices, had a heart attack right after, and died five days later at 76-years-old. When I was invited to interview Levy — an acclaimed faculty member at the Mannes College of Music — in anticipation of the DVD/Blu Ray debut of the Golden Globe-nominated “Florence Foster Jenkins” (released mid-December), I was offered a chance to get a vocal lesson in lieu of an interview. Realizing Levy needn’t be tortured further by a journalist’s agonizingly off-keyed soundings, I chose to apply my better skills and conduct this conversation. A member of the National Association of Teachers of Singing, the exuberant Levy is a vocal consultant and master class teacher at the Glimmerglass Opera and the Roundabout Theatre. Having coached dignitaries from theater stages to Hollywood such as actors Oliver Platt, Lauren Graham (“Gilmore Girls”), Lea Michelle (“Glee”), to MET tenor Yonghoon Lee, he has been deemed the expert on great singing. So, he most certainly could take on the challenge of training someone to do it horrifically. To that he adds an example: “Like in the part of the movie, The Lily Pons scene where you should have Pons’ beautiful voice in your head — that’s what Florence aspired to, she’s probably imagining or hoping that she would sound like young prime Lily Pons.” Nonetheless, she didn’t — much to everyone’s embarrassing dismay. Did Levy have to get into Jenkins’ psychology as well to understand how she would make her sounds? Yes, and in doing so he could then train others to make her sounds. “In this particular case. There are people who are what [you could call] beyond OCD. They have a narcissism or were brought up to think that everything they did was perfect so I assume that if they sing badly it’s much better than they think it is. “But in the case of Florence, it’s really partially physical ailments that distorted her perception of herself. But I don’t think it was a selfish or narcissism because really she put herself out there as a singer much later in her life so she didn’t although she had fine musical training it’s not like she was a laughing stock from her late 20s as a singer up until her death.